Washington Heights business owner Jarod Cronk built his consignment/”sharing” business and coffee shop, Sharehouse Goods, after career upheaval thrust him into the business world nine years ago. The former educator said he went through a dark time before he discovered his entrepreneurial abilities and figured out how he could use them to support his family and also fulfill his need to help others. Cronk’s entrepreneurial efforts and commitment to providing employment opportunities are driving a business revival in the 5500 block of West North Avenue, one of many city blocks that have not flourished for years. 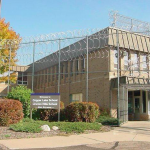 He purchased three adjacent buildings on the south side of North Avenue as well as a house and garages on the southeast corner of 55th Street and North Avenue. He has leased space to two other community-minded entrepreneurs. Cronk is also in the process of establishing other new business in his corner property. In 2012, Cronk acquired the two buildings at 5507 and 5513 W. North Ave. that housed the headquarters of Hartter’s European Fine Pastries for 40 years but had been vacant for almost a decade. 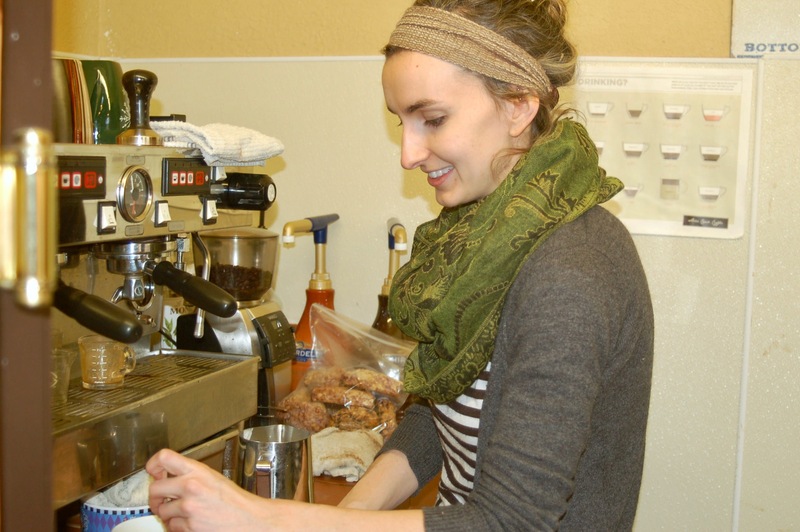 A Sherman Park homeowner, Cronk opened Sharehouse Goods, a coffee house, at 5507 W. North Ave. in April 2014. 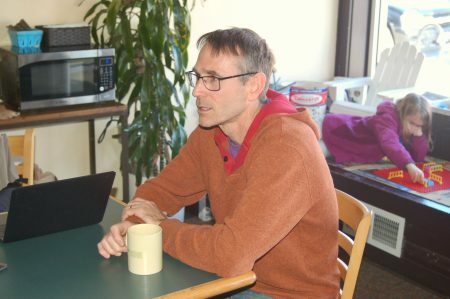 Tenant Chris McRoberts, owner of McBob’s Pub & Grill, 4919 W. North Ave., established McBob’s Catering Kitchen, a commercial kitchen and catering business next door to Sharehouse Goods at about the same time. McRoberts plans to start selling sandwiches there when Cronk’s other tenant, Vennture Brew Company, opens its beer bar and coffee shop next door to the west, in August, Cronk said. 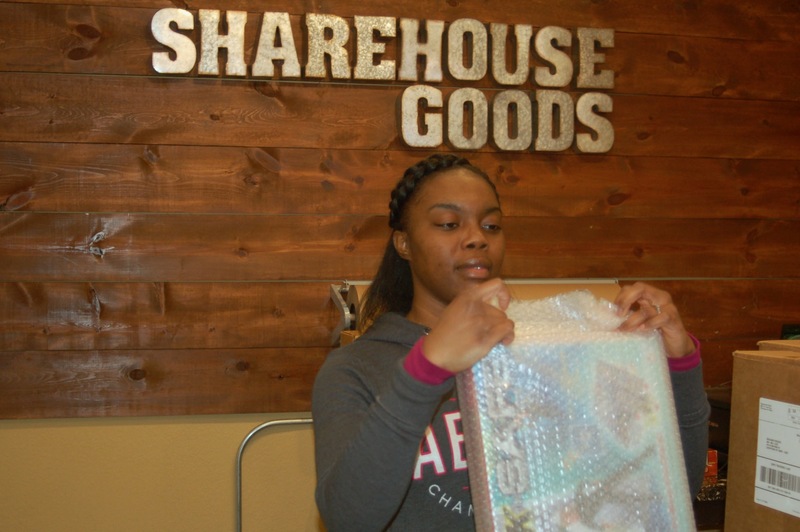 The name Sharehouse Goods refers to the initial business Cronk and his wife Bethany built reselling goods through Amazon that others “share” with them. They started by selling books they wanted to recycle and then began reselling books they found at rummage and library sales. The Cronks taught people they met along the way how to sell online, resulting in partnerships with people who sell through them. Cronk resells “just about anything you can put a bar code on,” including books, CDs and other media, he said. Accepting goods from anyone who wants to donate or consign them, Sharehouse’s large volume allows it to return 70 percent of the profit to its consignment partners. Some, including people facing obstacles to employment such as a history of incarceration, are sharing full time and making a living doing it, Cronk said. Initially working out of a warehouse at 30th Street and North Avenue, Cronk found he disliked the isolation. He opened the coffee shop, where he also has warehouse space and a shipping operation, to establish a presence in the community and interact with people living, working and passing through the neighborhood. At his coffee shop and four warehouses, he employs from eight to 12 people and writes consignment checks to an average of 40 to 60 individuals and organizations each month. “Sometimes it’s 70 or 80,” he said. Coffee shop manager Takeya Hibbler met Cronk through James Place Sherman Park, a career guidance center at Washington High School. Cronk offered Hibbler, a 2012 Washington graduate, a job at the suggestion of her fiancé. Cronk said she has become a valued employee who he leaves in charge of the business when he is out of town. Hibbler has been able to move out of her mother’s home and rent her own apartment with the money she has saved working at Sharehouse, she said. “It means a lot to me. Not everyone is fortunate to have a job and I’m grateful for it,” Hibbler said. Besides learning multitasking, customer service, phone etiquette and other skills, she has overcome her shyness and made many friends, she added. Cronk and a business partner, Michael Medcalf, are working to create their own line of high-quality coffee blends. They plan to begin testing them at the Bear Trax Race in Delafield on April 30 and Milwaukee Veg Expo in Wauwatosa on May 6. They are also planning to open a coffee roasting company. Sharehouse Goods now brews and sells Stone Creek Coffee. Cronk explained that Eric Resch, Stone Creek’s founder and co-owner, is mentoring him as part of his own commitment to improving the city. Resch has said that coffee, the second most traded commodity in the world, changes lives, Cronk noted. Like Cronk and Resch, Medcalf, has a strong interest in developing the central city and its residents. The 29-year-old African-American business professor and entrepreneur grew up in Bayside, graduated from Nicolet High School and earned bachelor’s and master’s degrees at UW-Whitewater. Because his mother taught in MPS schools for more than 30 years and he teaches city residents at MATC, Medcalf is aware that many suffer from gaps in their education. Cronk’s business philosophy, with its “philanthropic undertone … immediately made me gravitate towards him,” Medcalf said. “It’s what I’ve done in my own practice working in education. 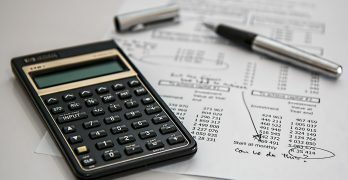 Obviously you have to make money to support yourself but doing so in a way that others benefit as you progress in your own endeavors” is an important part of his philosophy, he said. Medcalf explained that he and Cronk intend to sell their “MKEing Coffee,” with the tagline “Good Coffee for a Good City,” using a club membership model in which members receive a 12-ounce bag of coffee delivered to their homes every three weeks. Cronk and Medcalf plan to build a sales force of formerly incarcerated people who will earn half the profit of their sales. Cronk also plans to open a cold-pressed juice café in the property east of 55th and North. Aw. I love this story! What Sharehouse and employees bring to Milwaukee is so good and I’m glad more people will know about it. Sharehouse is truly a model of what makes Milwaukee great – that entrepreneurial-resourcefulness and passion to help others. It’s such a magical place that I’m glad I discovered walking around on North Ave. one day! Thanks Andrea + NNS for highlighting them! An amazing and inspiring story.